We’re in the middle of my annual October Unprocessed challenge, where I encourage as many people as possible to eat only unprocessed food for the entire month. This isn’t the only challenge that runs for thirty (okay, thirty one) days. Lots of others do it, of course. Why? Because that’s enough time to make a lasting change in your habits. Simple enough, right? To make a lasting change in your habits, it’s important to look at all three steps: the cue, the routine, and the reward. And if you’re able to change those enough, you’ll regain control of the cycle and your actions will eventually run on “automatic” — thus making them an actual habit. The Cue: Some cues may be unchangeable (say, coming home from work, or waking up in the morning) – but others you may be able to change. Perhaps you’ve figured out that one of your triggers is when you drive past a certain fast-food restaurant on your way home from work. It could be as simple as choosing an alternate route. The Reward: This is the part that makes the habit all worthwhile, right? I’m not talking about a guilty-pleasure-reward, of course, like treating yourself to an indulgence. I’m talking about something positive and sustainable. If I practice my yoga, then I feel good all day long and have more energy. I like feeling good and having more energy! The Craving: This is the key to the whole thing — the part where you anticipate and truly crave the reward. The craving is keeps you coming back for more of the routine. 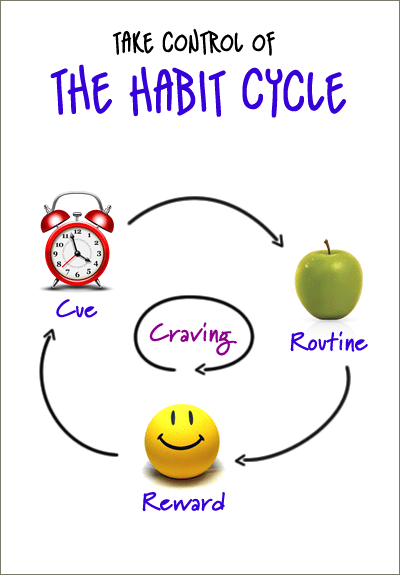 You need to developing the craving — the expectation of the reward — for the routine to become a habit. 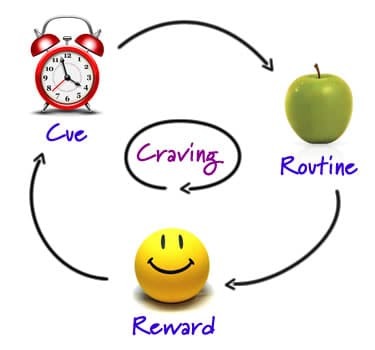 Once you understand the cue-routine-reward-craving cycle, you can learn to recognize each step in the process, and work, specifically, to change it. So now, let’s get back to our thirty days. 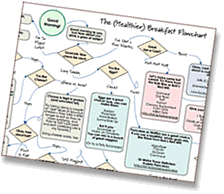 Now that you know how the cycle works, you can take more specific actions to create or change it. Here are a few tools I’ve found to be tremendously useful. Set multiple, incremental goals – If you just pick one giant, month-long goal, you may get stuck because it’s just too daunting. Instead, keep your big goal in mind, but set smaller goals. You could have a goal for every day (even if it’s the same goal every day), with slightly larger goals on a weekly basis. Each day it’ll get a little bit easier to achieve the goal. Focus on small victories – It’s important to recognize when you have a “win” — and equally important not to be too hard on yourself if you don’t achieve your goal. Pick yourself up, do the dusting-off thing, and remember that tomorrow’s another day. Set reminders – This speaks directly to the cues. Simply setting a reminder on your computer or smart phone, or even an alarm clock, is a great way to create a very specific cue. You could also use your calendar app to send yourself an email reminder at a certain time every day. Get support – Don’t go it alone! Surrounding yourself with supportive, like-minded people is tremendously helpful. (Equally important is steering clear of people who drag you down.) I cannot stress enough the importance of getting support from family and friends. If you can’t find it from them, seek support elsewhere — online, weight watchers, boot camp, and so on. Focus on the positive impact of your change – In other words, focus on the reward, and reinforce it by really appreciating it. By taking time to savor the good feelings of the reward, you’ll strengthen the (now-positive) cycle, thus closing the loop on your good habits.